Quantitative tests of liver function (QTLF) which are based on the hepatic metabolism or clearance of test substances have been successfully used to predict prognosis of a variety of different liver diseases. Still sufficient data in HIV-patients under anti-retroviral therapy (ART) are lacking. Therefore, the aim of this prospective study was to investigate if and to what extent ART influences a broad panel of quantitative tests of liver function in patients with HIV-infection. Nineteen patients (14 males, 5 females, mean age 40 years) with HIV-infection underwent QTLF including lidocaine half-life test (LHT), galactose elimination capacity (GEC), and indocyanine green clearance (IGC). These tests were performed before and 3 to 6 months after initiation of anti-retroviral therapy. Twenty age-matched healthy, medication-and virus-free adults served as controls. Lidocaine half-life was significantly lower in HIV-patients without ART. Combining anti-retroviral therapies shifted cytochrome p450 activity back into standard ranges. Galactose elimination capacity as a parameter of cytosolic liver function and indocyanine green clearance as a parameter of liver perfusion were not affected by ART. QTLF may be a tool to predict prognosis or hepatic complications in HIV-infected patients with liver disease. Early determination of lidocaine half-life seems to be useful - this should be considered during the treatment of HIV-positive individuals. Liver toxicity is one of the most relevant adverse effect of anti-retroviral therapy (ART) in patients infected with human immunodeficiency virus type-1 (HIV-1) (Lebovics, Thung et al. 1985; Schneiderman, Arenson et al. 1987). Although there are many other causes of liver disease in these patients (Farrell 2002), the most common are viral co-infections, drugs and narcotics, which are most prominent upon treatment with highly active anti-retroviral therapy (HAART). Likewise, both nucleoside reverse transcriptase inhibitors (NRTI) and protease inhibitors (PI) are associated with metabolic alterations and disorders, such as liver toxicity, lipodystrophy and insulin resistance (Ena, Amador et al. 2003; Lee, Seneviratne et al. 2004). The spectrum of liver damage in this population ranges from simple hepatic steatosis to steatohepatitis and even fibrosis (Clark, Brancati et al. 2002). Most patients with hepatic alterations are asymptomatic, and liver disease may unexpectedly be diagnosed during the evaluation of unexplained persistent elevations of serum liver enzymes. In this case, and once other known aetiologies have been ruled out, imaging procedures often suggest fatty infiltration of the liver parenchyma (Yano, Tagawa et al. 2001). Since most of these patients are indolent, fatty liver seems to be a benign and stable disease (Reid 2001). Nevertheless, sensitizing the liver may lead to acute-on-chronic liver failure (Kahraman, Miller et al. 2006) or cryptogenic cirrhosis with the necessity of liver transplantation. Consequently, it is of major clinical importance to assess stage and prognosis of liver disease in HIV-positive patients. Conventional serum parameters (e. g., coagulation factors, albumin or cholinesterase) often lack sensitivity in early stages of liver disease and are mostly changed in advanced stages. However, the available routine laboratory tests only reflect individual facets of liver injury, synthetic capability or a pre-existing disease. They are not able to identify patients with marginal liver function. Various laboratory data and imaging techniques have been used to complement the Child-Turcotte-Pugh or the MELD score to predict severity of liver disease and assess functional hepatic reserve. Therefore, quantitative tests of liver function (QTLF) may be a useful diagnostic tool to predict prognosis and outcome of liver disease in HIV-infected patients under anti-retroviral therapy, and they may be useful to search for drugs that restore liver function. Quantitative or dynamic liver function tests were introduced in the middle of the last century (Bradley, In gelfinger et al. 1945; Leevy, Mendenhall et al. 1962; Tygstrup 1963). They measure the turn-over or elimination of an exogenous test substance that is exclusively metabolized and eliminated by the liver, and have helped to elucidate the structure-function relationship of the liver. Furthermore, they have been shown to have a prognostic value independent of and often superior to that of scores like the Child-Turcotte-Pugh or the recently used MELD score (Reichen 1995). All quantitative tests are based on the hepatic clearance principle. The clearance of the test substance is determined by the liver blood flow via the portal vein and the hepatic artery, as well as by the degree to which this test substance is extracted by the liver, whereas the final elimination depends on the hepatic metabolic capacity. Depending on the administered compound, it is possible to separately analyze microsomal (e. g., aminopyrine, caffeine, erythromycin, methacetin, phenacetin), cytosolic (galactose, phenylalanine) or mitochondrial (α-ketoisocaproic acid, methionine) metabolic pathways. Most available data come from microsomal function tests; data about cytosolic and mitochondrial liver function are more limited. The effects of liver perfusion-dependent metabolism, induction or inhibition of cytochrome p450, nutrition or age provide little dependable information to evaluate functional liver mass (Armuzzi, Candelli et al. 2002; Schneider, Caspary et al. 2004). QTLF include for example the lidocaine half-life test (LHT), the galactose elimination capacity (GEC), and the indocyanine green clearance (IGC). LHT reflects the function of the cytochrome p450 system and the quality of detoxification of liver cells (Lamesch, Ringe et al. 1990; Reichel, Wienkoop et al. 1995; Reichel, Wienkoop et al. 1995; Jochum, Beste et al. 2006). Disappearance of lidocaine is dependent upon liver perfusion as well as metabolism by different cytochrome p450 isoenzymes. GEC reveals the metabolic liver function (Tygstrup 1966; Tygstrup, Andersen et al. 1985; Keiding 1987) whereas IGC provides information about the hepatic perfusion and the excretion output of the bile, at least in healthy livers (Leevy, Mendenhall et al. 1962; Meijer, Weert et al. 1988; Plevris, Jalan et al. 1999; Ott, Clemmesen et al. 2000). So far, data about QTLF are existent for patients with liver cirrhosis due to chronic HCV-infection to assess disease severity, for patients with liver cirrhosis to discriminate between different aetiologies, for patients with chronic hepatitis B and C co-infection in relation to fibrosis, for patients with non-cirrhotic chronic hepatitis C-infection to predict portal vein velocity, and finally for living liver donors and their recipients to assess functional hepatic reserve (Herold, Berg et al. 2000; Herold, Heinz et al. 2001; Herold, Heinz et al. 2001; Herold, Ganslmayer et al. 2002; Herold, Regn et al. 2002; Herold, Ganslmayer et al. 2003; Jochum, Beste et al. 2006; Reichen 2006). However, still sufficient data in HIV-patients comparing several quantitative tests of liver function are lacking, and to date no clinical study has been carried out to assess the values of these tests in patients with HIV-infection. We therefore tested the hypothesis if liver function might be restored in patients with HIV-infection following antiretroviral therapy. Here, we investigated if and to what extent changes in either hepatic metabolic enzyme function and in liver perfusion can be achieved by antiretroviral therapy, and also if changes in QTLF may help to discriminate responders from non-responders to anti-viral treatment strategies in patients with HIV-infection. We applied the panel of LHT, GEC and IGC to 19 patients with HIV-infection under therapy with different anti-viral regimes and compared these results to a healthy, medication-and virus-free control group. Beside the evaluation of the liver function under antiretroviral therapy, we especially paid attention to the liver function of HIV-patients with HCV co-infection under ART since infection with the more liver-specific HCV can compromise liver function. Nineteen consecutive patients of all risk classes (14 males and 5 females, mean age 40 ± 11.3 years) with HIV-infection were included in this prospective study (Table 1). Among these HIV-patients, 6 were classified C3, 9 were classified B1/2, and finally, 4 were classified A1/2 according to the CDC-classification of 1993. Values for CD4+ T cells were between 70 to 1200/μl and viral load ranged between < 50 to 360.000 copies/ml. Moreover, 7 of these patients had a HCV co-infection. 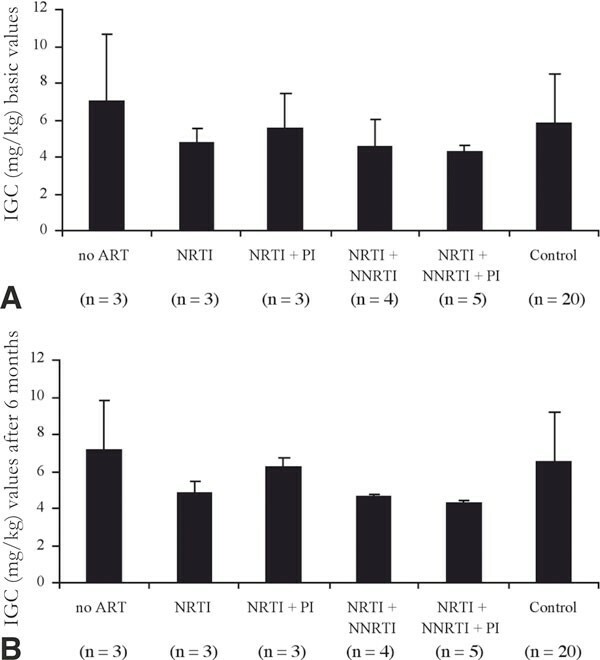 Three patients were treated with NRTI (nucleoside reverse transcription inhibitor) alone, 4 with NRTI + PI (protease inhibitor), 4 with NRTI + NNRTI (non-NRTI), 5 with NRTI + NNRTI + PI, and finally, 3 patients were without ART. Chronic alcohol abuse was not observed in any of these patients (< 60 g/day in men and < 30 g/day in women). Patients other than Caucasian origin, age < 18 or > 65 years, active drug abuse, and other causes of liver disease were excluded. In addition to exploration of the case history and the clinical status, chemical laboratory values were determined for all HIV-patients. Twenty age-and gender-matched healthy, medication-and virus-free adults served as controls (15 males and 5 females, mean age 42.1 ± 7.5 years), and all values of QTLF in HIV-patients were correlated with the normal values of this group ( Table 1). To assess the condition of the liver in the control group, several liver parameters including serum transaminases, total bilirubin, γ-GT, serum bile acids, albumin, and routine coagulation tests were determined, which were within normal ranges. All patients underwent QTLF before and 3 to 6 months after the initiation of anti-retroviral therapy. The current study was performed in accordance to the ethical standards formulated in the version of the 1964 Declaration of Helsinki. All patients gave their informed consent prior to inclusion in this present study. Before performance of the QTLF, all drugs (e. g., barbiturates, benzodiazepines, anti-depressive drugs, H2-blockers, grapefruit juice, etc.) that could potentially interfere with liver function were discontinued in both groups 4 weeks in advance. The following three pharmacokinetic tests were performed to quantitatively assess changes in liver function during anti-retroviral therapy for each patient. Briefly, lidocaine (xylocaine 2%, Firma Astra, Wedel, Germany) was given as a single bolus injection of 1 mg/kg body weight over 2 minutes, 5 ml blood samples were obtained from a peripheral vein at 30, 60, 120, 180, 240, and finally 300 min., and detected in the serum using the Fluorescence Polarization Immunoassay Method by the Abbott TDX-System (Firma Abbott, Wiesbaden, Germany). Lidocaine concentrations were expressed in μg/ml and were calculated against an internal calibration curve. Background concentrations measured before infusion of lidocaine were subtracted from all results. The assay used had a limit of detection of 5 ng/ml. Lidocaine half-life was expressed in minutes. To determine GEC, galactose (Pharmaceutical Institute, University of Essen, Germany) was injected intravenously as a bolus (45% galactose, 0.5 g/kg body weight), which saturates the catabolic enzyme system. The speed at which elimination of galactose takes place is determined by its phosphorylation by galactokinase which is located in the hepatic cytoplasm. Serum samples were treated with 1 ml of 0.33 M perchloric acid per 200 μl serum and centrifuged at 2.400 g. The supernatant was analyzed using the Enzymatic Test Kit Galactose (Firma Roche Diagnostics GmbH, Mannheim, Germany). Urine was collected over a period of 5 hours after injection of galactose. The volume of the collected urine was measured, and for calculation of GEC at time point 0 and from 20 to 60 minutes (5 minutes intervals), serum concentrations of galactose were determined photospectrometrically (PM6, Firma Zeiss, Oberkochem, Germany) at 366 nm. GEC was calculated using the following formula: (infusion dose [g] galactose - galactose in urine [g])/(time at concentration 0 + infusion time) × 1.000/kg body weight. The results were expressed as mg/kg/minute. IGC is absorbed exclusively by the liver and, if there is a high hepatic elimination rate, the substrate is quickly excreted in a mostly unmodified form by 97% in the bile. Therefore, IGC is influenced both by the biliary secretion capacity and by the liver perfusion. In addition, IGC is considered to be insensitive to pharmacological influences because its metabolism solely depends on the hepatic transport and biliary secretion. This test is the most widely used clearance test for liver diseases. Nevertheless, it remains imperfect because it depends both on the hepatic blood flow and on the functional capacity of the liver. IGC (Cardio Green, Firma Paesel, Hamburg, Germany) is also injected intravenously as a bolus of 0.5 mg/kg body weight. Serum concentrations were also measured photospectrometrically at 800 nm every 3 minutes until 21 minutes post-injection. Values were expressed as half-life in minutes. Serum transaminase levels, parameters of cholestasis, and coagulation factors were determined by routine methods at the Department of Medical Chemistry, University of Essen. All data are expressed as the mean ± standard error unless otherwise indicated. For statistical analyses, the Mann-Whitney U test for unrelated groups was used to compare HIV-patients and healthy controls at different time points. For comparison within these 2 groups at different time points, we used the Wilcoxon test for connected samples. Differences between groups were compared using analysis of variance (ANOVA) for repeated measures and post-hoc Bonferroni test to correct for multiple comparisons. Calculations were made using Microsoft Excel software and publicly available internet sources (In-Stat Software, Graph Pad, San Diego, California). A p value less than 0.05 was considered to be statistically significant compared to the controls. We first investigated the influence of different anti-retroviral regimens on lidocaine half-life. As demonstrated in Figure 1A, in healthy controls and in HIV-positive patients without ART lidocaine half-life was significantly lower than in each treated sub-group of patients with HIV-infection suggesting a higher activation of the cytochrome p450 system. Lidocaine half-life was measured before initiation and after 6 months of treatment. HIV-positive patients treated for 6 months with anti-retroviral therapy had a prolonged lidocaine half-life as compared to the decreased values in the HIV-infected naïve group. Lidocaine half-life before the initiation of ART is also depicted. This increased activation in treated patients with HIV-infection might be a virus-induced effect. In addition, combining anti-retroviral therapies (Triple-Nuc, NRTI + NNRTI or NRTI + PI) shifted cytochrome p450 activity back into standard ranges. Interestingly, no obvious differences according to the various ART combinations could be demonstrated. Measurement of lidocaine half-life before and after initiation of therapy in HIV-patients with various anti-viral regimens: A. Lidocaine half-life - expressed in minutes - was significantly lower in HIV-patients without ART. * p < 0.05, n = patients' number. B. Lidocaine half-life - measured 3 and 6 months (mo.) after initiation of ART - was almost identical with no obvious changes under antiretroviral treatment in patients with HIV-infection. C. Hepatitis C co-infection in HIV-patients had no significant influence on lidocaine half-life and activity of cytochrome p450. Next, we investigated if and to what extent lidocaine half-life changed in HIV-patients upon treatment with ART for both 3 and 6 months. Lidocaine half-life test was performed in 10 randomly selected patients out of 19 with HIV-infection. As shown in Figure 1B, l idocaine half-life was insignificantly changed before the initiation of anti-retroviral therapy and during the follow-up examination, and decreased from 161.5 (range 82-304) to 154.7 (range 85-341) minutes (p = 0.84). Further, lidocaine half-life test showed no significant changes during the follow-up examination in patients with HIV-infection as compared to the healthy control (range 90-322 minutes). The monoethylglycinexylidide (MEGX) test is a dynamic test based on the conversion of lidocaine to MEGX primarily by cytochrome p450 3A4 (CYP3A4). Losses of hepatic CYP450 3A4 activity or changes in hepatic blood flow result in decreased MEGX formation. Previous studies have revealed that the MEGX test is an effective tool for assessing liver function and furthermore, this test has a high reliability when repeated (Oellerich and Armstrong 2001). We therefore investigated the prognostic value of the MEGX test in our study population. The test was performed before and 6 months after the initiation of ART, and results were compared to values obtained from healthy controls. However, we found no significant changes in HIV-patients treated with various combinations as compared to healthy controls without medication (49.9 ± 25.48 μg/l versus 66.29 ± 38.55 μg/l, p = 0.23). Within the 19 HIV-patients in our study, 5 of them were co-infected with HCV. Six patients had a former hepatitis B-, and 2 patients had a former hepatitis B-and C co-infection (Figure 1C). Lidocaine half-life in dependence to HCV co-infection was only slightly increased but not significantly affected, suggesting that hepatitis C infection might be negligible on the liver function of HIV-patients, and is not a contra-indication for anti-retroviral therapy, although hepatitis C virus is more liver specific and can compromise quality of liver function. However, this result should be interpreted with caution because of the limited number of patients investigated. Determination of other markers of liver function such as transaminases, total bilirubin, and cholinesterase (CHE) revealed significant changes only for ASTvalues in HIV-infected patients with HCV co-infection as compared to HIV-patients without hepatitis C infection ( Table 2). Indocyanine green clearance was performed before and 6 months after initiation of HAART to investigate the correlation between hepatic perfusion and different anti-retroviral regimens in patients with HIV-infection. Three HIV-patients were without ART, 3 further patients were either treated with NRTI or with NRTI in combination with PI, 4 patients were treated with NRTI + NNRTI, and finally, 5 patients were treated with the combination of NRTI + NNRTI + PI. As depicted in Figure 2A and 2B, no correlation could be found between indocyanine green clearance and various anti-retroviral regimens in HIV-patients. Indocyanine green clearance - as a parameter of biliary secretion capacity and liver perfusion - was not dependent on the different anti-retroviral regimens in patients with HIV-infection. IGC is expressed as mg/kg; n = patients' number. A. Determination of IGC before initiation of HAART. B. Determination and course of IGC after 6 months of anti-retroviral treatment. To test if metabolic liver function is improved in HIV-patients under ART, GEC was performed in non-treated patients with HIV-infection, and values were then compared to the values of treated patients. Again, as demonstrated before for the indocyanine green clearance, no significant differences were observed between HIV-patients before and after the initiation of anti-retroviral therapy ( Figure 3A). Measurement of GEC in patients with HIV-infection: A. Galactose elimination capacity - determined before and 6 months after initiation of ART - was not influenced by various anti-retroviral regimens. B. GEC was not significantly reduced during co-infection with hepatitis C virus. C. The metabolic liver capacity oscillated under long-term therapy for 3 to 6 months remained unchanged without obvious tendency. PAT = patients' number; GEKDIF = differences in GEC. Galactose elimination capacity in HIV-patients was unaffected by co-infection with hepatitis C virus. Fife out of 19 patients with HIV-infection were co-infected with hepatitis C virus (Figure 3B). During anti-retroviral therapy, values for GEC changed only marginal from 7.7 mg/kg/min. in HIV-patients without HCV co-infection as compared to 5.75 mg/kg/min. in HIV-patients with hepatitis C co-infection. GEC was apparently reduced in patients with HIV-HCV co-infection indicating a reduction of cytosolic liver function. However, this reduction was statistically not significant. In our final experiment, 10 randomly selected patients with HIV-infection had a follow-up examination after 3 to 6 months of treatment with anti-retroviral therapy. As demonstrated in Figure 3C, the metabolic liver capacity oscillated during this long-term therapy was mainly unchanged without obvious tendency. Hepatic steatosis is a common feature developing upon application of state-of-the-art anti-retroviral regimens, including nucleoside reverse transcriptase inhibitors (NRTI), non-NRTIs and protease inhibitors. Still, severe hepatotoxicity is a rare event. However, with the increasing employment of HAART in developed countries, hepatic steatosis and severe hepatotoxicity with acute liver failure may be seen more often among patients with HIV-infection (Montessori, Harris et al. 2003; Kahraman, Miller et al. 2006). The substantial survival benefit of HAART in the treatment of patients infected with HIV-1 has been frequently documented, revealing both a reduction in morbidity and mortality as well as a significant improvement in the quality of life (Lipsky 1996; Ristig, Drechsler et al. 2005). Still, alongside the benefits of these treatments, HAART-associated adverse events become increasingly apparent. These ranged from mild side-effects, such as abdominal pain, polyneuropathy or elevated liver enzymes to severe life-threatening complications, such as acute liver failure, pancreatitis, and lactic acidosis. Quantitative tests of liver function may allow a prognostic assessment of patients with various liver diseases (Herold, Berg et al. 2000; Herold, Heinz et al. 2001; Herold, Heinz et al. 2001; Herold, Ganslmayer et al. 2002; Herold, Regn et al. 2002; Herold, Ganslmayer et al. 2003; Jochum, Beste et al. 2006; Reichen 2006). Although transaminases - the commonly used markers of hepatocellular injury - have a high sensitivity in screening for liver diseases, they do not provide any information about prognosis. In addition, assessment of liver function using bilirubin, serum albumin and pro-thrombin-time is limited by their inability to identify the functional reserve of the liver. Dynamic liver function tests are therefore an improvement on the static tests. They are cost-effective, easy to perform and analyse, safe, have a simple pharmacokinetic profile with minimal drug interactions, have a high predictive value, and finally, provide quick results (Jalan and Hayes 1995; Candelli, Cazzato et al. 2004). The value of these tests has been demonstrated for patients with acute reduction of the hepatic metabolic capacity, such as in fulminant liver failure and alcoholic hepatitis (Merkel, Bolognesi et al. 1989). However, the value of QTLF in patients infected with HIV is debatable, since parameters of QTLF could be influenced by different co-factors such as anti-viral drug administration, viral co-infections, and age. Still, there is insufficient data about these patients and a comparison of various QTLF is still lacking. Recent studies have described changes of a single QTLF in patients with chronic hepatitis C-infection receiving interferon therapy (Ocker, Ganslmayer et al. 2005). In the present study, we determined a panel of three QTLF and, when compared to a healthy control, lidocaine half-life as a parameter of detoxification quality of hepatocytes was found to be significantly reduced in HIV-positive patients without anti-retroviral treatment. A number of medications that are commonly used in HAART regimens are metabolized by the hepatic CYP enzymes, which raises the possibility of significant interactions between anti-retroviral medications and hepatic impairment. The cytochrome p450 isoenzyme CYP1A2 is the main isoform responsible for lidocaine biotransformation. In HIV-positive patients protease inhibitors (for example lopinavir/ritonavir) can lead to the induction of CYP1A2 which may interact with lidocaine metabolism (Orlando, Piccoli et al. 2004; Wyles and Gerber 2005). We conclude that measuring LHT may be a tool to predict prognosis or complications in HIV-infected patients with liver disease, and may help to discriminate positive patients' response from negative response. In HIV-positive patients with compromised liver function this might help to modify anti-retroviral therapy and switch to drugs that are less hepatotoxic. Severe hepatotoxicity in HIV-infected patients receiving HAART occurs in 5 - 10% of cases. The main risk factors are viral co-infections, advanced liver disease, and elevated liver enzymes at the start of therapy. Anti-retroviral drugs associated with an increased risk of severe hepatotoxicity are stavudine, didanosine, nevi-rapine, full-dose ritonavir and tipranavir (Vogel and Rockstroh 2005; Vogel and Rockstroh 2007). We observed an increase in the activity of cytochrome p450 in HIV-positive patients with different ART regimes - which might be a virus- or a drug-induced effect. Combining anti-retroviral therapies shifted cytochrome p450 activity back into standard ranges. However, the different components of HAART are each associated with risks of liver toxicity. Most drugs are metabolized by cytochrome p450 enzymes in the liver, and this may be affected by liver disease. The mechanisms for drug-induced liver injury include dose-dependent toxicity, idiosyncratic reactions, mitochondrial toxicity, and immune reconstitution. Once diagnosed, management generally involves discontinuation of the offending anti-retroviral drugs. Therefore, QTLF may provide important prognostic informations in patients with HIV-related liver disease and tolerability of HAART (Inductivo-Yu and Bonacini 2008). Activation of the cytochrome p450 system showed no essential differences in HIV-patients with HCV co-infection. However, this co-infection seems to be negligible on liver function, and is not a contra-indication for ART. Ocker and colleagues investigated to what extent anti-viral therapy influenced QTLF in patients with HCV-infection. Patients with HIV co-infection were unfortunately excluded from the study. Tests were performed before and 3 months after the initiation of therapy. They demonstrated that parameters of microsomal and cytosolic liver function were reduced in all patients before therapy initiation and returned to normal values in therapy responders after 3 months. Parameters of liver perfusion were not affected by anti-viral therapy. According to the authors, early determination of GEC may differentiate responders from non-responders to anti-viral treatment in patients with hepatitis C-infection (Ocker, Ganslmayer et al. 2005). In a further study, Herold et al. applied a broad panel of QTLF to patients with hepatitis B and C-infection. Again, patients with HIV co-infection were unfortunately not included in the study. All QTLF values were correlated with liver histology and Child-Pugh classification for liver cirrhosis. The authors could demonstrate that in patients with moderate fibrosis, metabolic liver function was significantly decreased whereas hepatic perfusion remained normal. Severe fibrosis and cirrhosis showed a significant decline in all QTLF. Viral aetiology and HCV genotypes did not change QTLF (Herold, Heinz et al. 2001). In our present study, parameters of the cytosolic metabolic capacity, liver perfusion and secretion were not compromised in non-treated versus treated patients with HIV-infection. We examined IGC and GEC and found no significant correlation. 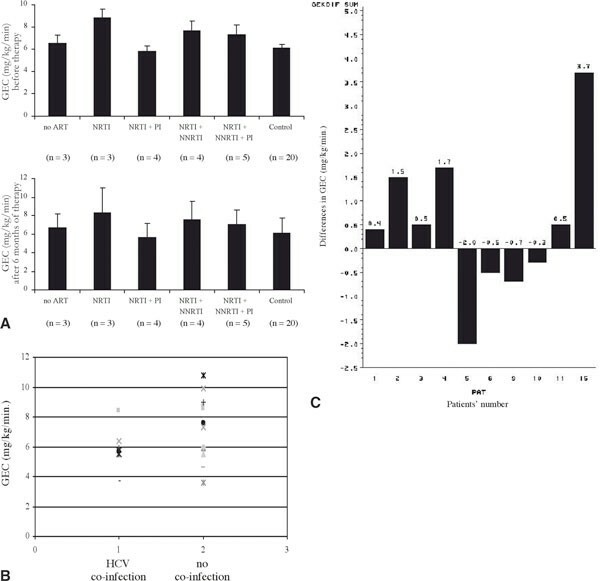 Therefore, we conclude that viral damage to the liver compromises quality of liver detoxification before metabolic capacity and hepatic perfusion. The great variability of GEC within HIV-infected patients might be related to the small number of patients investigated in this study or to different anti-viral regimens. So far, no data exist about impact of different components of HAART on GEC. Compared to treated patients with HIV-infection, we found a significant reduction in lidocaine half-life before the initiation of anti-retroviral therapy. However, we found no significant influence of hepatitis C co-infection although infection with hepatotropic viruses affects liver function. The reason is obviously the small number of patients investigated with HIV-HCV co-infection. Until now, QTLF have not been validated in patients with HIV-infection. At present, it remains unclear if and how far QTLF may provide important prognostic informations in patients with HIV-related liver diseases that is superior to that of conventional prognostic parameters or risk scores. 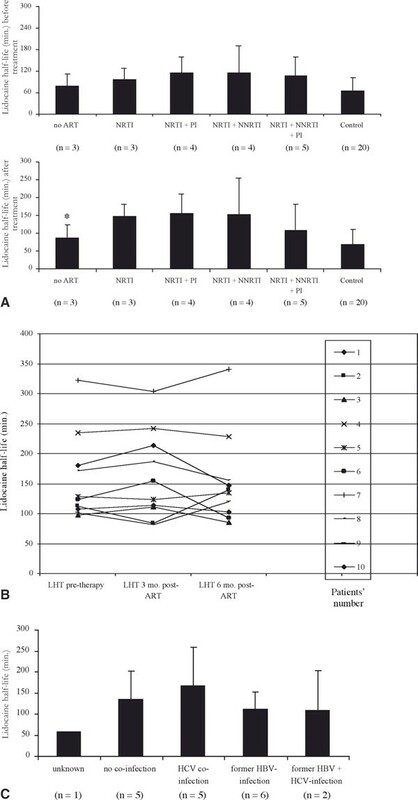 Our current study suggests that certain QTLF could be useful to monitor the effect of anti-retroviral or liver-protective therapy in patients with liver disease caused by HIV-infection and additionally, it may be an economical method to follow up these patients - particularly those under treatment with ART. Repeated measurements of lidocaine half-life with a simple device can predict the outcome and therefore, might be clinically useful in following patients with HIV-infection. For example, assessment of IGC removal has been demonstrated in many different clinical settings to have major predictive power with respect to morbidity and mortality (Reichen 1995). It is well known that all anti-retroviral drug classes, nucleoside/nucleotide reverse transcriptase inhibitors (NRTI), non-nucleoside reverse transcriptase inhibitors (NNRTI), and protease inhibitors (PI) may cause hepatotoxicity but in different pathways (Abrescia, D'Abbraccio et al. 2005). However, in our experiments we did not observe significant changes in quantitative liver tests in dependence to diverse anti-retroviral regimens. So far, we evaluated only a small group of HIV-patients. Since QTLF could be useful to monitor anti-retroviral therapy in patients with HIV-infection and regarding the increasing role of liver-related morbidity and mortality in HIV-infected patients, more prospective randomized, controlled trials with a larger number of patients are justified. M Miller, A Kahraman contributed equally to this work. quantitative tests of liver function. We would like to thank the anonymous reviewers for their most valuable and insightful suggestions.